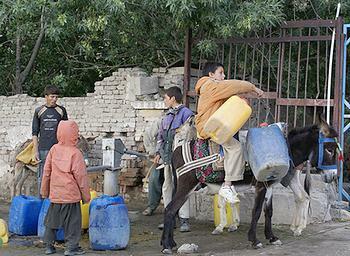 RESTON, Virginia, June 18, 2010 (ENS) – In Afghanistan’s Kabul Basin, at least half the shallow drinking water wells supplied by groundwater are likely to become dry or inoperative within 50 years as a result of climate change, according to new research by U.S. and Afghan scientists. A combination of higher temperatures due to global warming and the increasing demands of a larger population is predicted to stress the basin’s water. These are the findings of a new study conducted by the U.S. Geological Survey in collaboration with the Afghanistan Geological Survey, a division of the Afghanistan Ministry of Mines, and the Afghanistan Ministry of Energy and Water. Results of the multidisciplinary water resources assessment conducted between 2005 and 2007 were released this week. Over the next 50 years, the researchers estimate that drinking water needs in Afghanistan’s Kabul Basin will increase sixfold due to population growth as refugees return. At the same time, future water resources in the basin will be reduced as a result of increasing air temperatures associated with global climate change. In some areas of the basin, such as in the north along the western mountain front and near major rivers, water resources are generally adequate for current needs. In the east and away from major rivers, the available water resources may not meet future needs. “Investigating water resources in a country affected by war and civil strife, which have left a more than 20-year gap in the scientific record, is challenging,” said Thomas Mack, USGS scientist and lead author on the report. Most hydrologic and climatic data collection in Afghanistan were interrupted in the early 1980s as a consequence of war and civil strife and did not resume until 2003 or later. Although there is uncertainty associated with climate change projections, Mack said that the warming trends forecast for southwest Asia would likely result in adverse changes to recharge patterns and further stresses on limited water resources. The Kabul River, which passes through the capital, Kabul, is little more than a trickle for most of the year, but swells in summer due to melting snows. Groundwater in the basin’s less widely used deep aquifer may supply future needs, yet the sustainability of this resource for large withdrawals, such as agricultural uses, is uncertain. 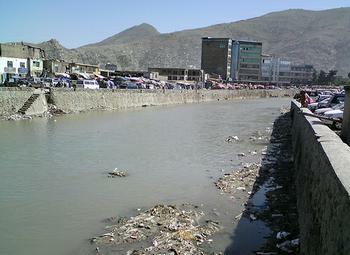 The study also warned that contamination Kabul’s in shallow drinking water sources also is a concern. “Water resources in the Kabul Basin are a critical issue for both the people of Afghanistan and U.S. military personnel serving there,” said USGS Director Dr. Marcia McNutt. “The work the USGS has done in providing insight about the water situation in the basin can help with future water-resource planning and management efforts and can be applied to other areas of Afghanistan,” she said. In conducting this study, researchers used remotely sensed data and, where available, historical records to investigate the water resources of the Kabul Basin. They integrated recently acquired remotely sensed data and satellite imagery, including glacier and climatic data with recent climate change analyses, geologic investigations and analysis of streamflow data. Groundwater and surface water quality data, including data on chemical and isotopic environmental tracers, were collected. Finally, estimates of public-supply and agricultural water uses were integrated to provide a comprehensive overview of water resources in the basin. Click here to read the full report, “Conceptual Model of Water Resources in the Kabul Basin, Afghanistan.” The report was prepared under the auspices of the U.S. Agency for International Development.